Heavy on symbolism, this picture shows Lady Liberty in cuffs with her torch and tablet at her feet. Lady Liberty was one of many who set a new arrest record in Washington DC as police cuffed and took them away during the Democracy Spring demonstration. Thousands of protesters participated in a 140 mile walk from the Liberty Bell in Pennsylvania to the capital where they gathered to peacefully speak out against corruption and money in politics. As of this writing the protest has been ignored by mainstream media except for a 35 second report by NBC. 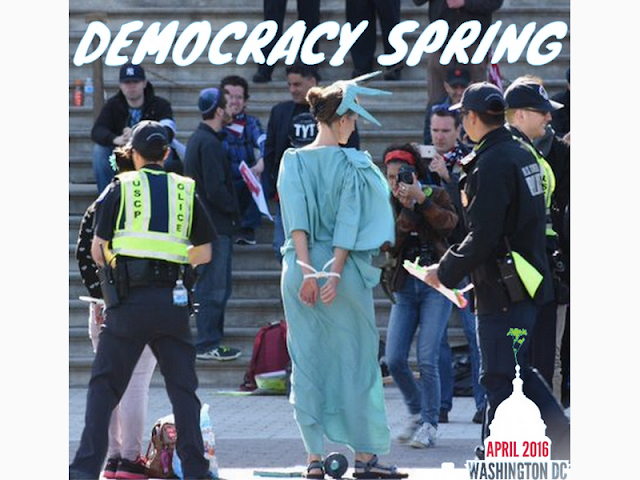 However, below the break, are the nearly 250 organizations who support Democracy Spring.